When children are confronted with illness or injury they often experience anxiety and distress about their situation. A specially equipped cart at Norton Children’s Hospital is designed to help ease children’s stress and anxiety. 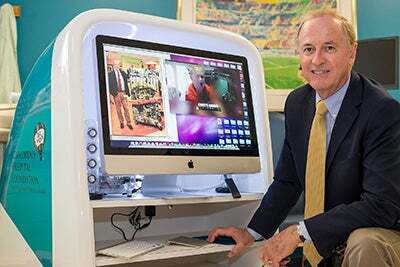 The Coping Cart, a one-of-a-kind mobile multimedia center designed to be used by children while in the hospital, is easily transported to patient rooms or to areas of isolation for children whose care requires it. 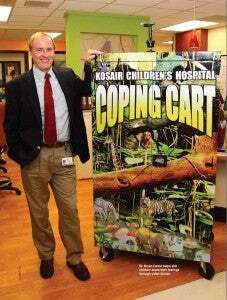 The core component of the Coping Cart, which was conceptualized and designed by Dr. Carter, is a computer video recording and editing system that allows patients to experience the active process of making videos about their hospital stay, their understanding of their medical condition, and their experience in developing methods for coping with the many stressors associated with their illness and hospitalization. These activities can facilitate both adjustment to their illness as well as improved adherence to their treatments. The finished product is a DVD that the child can take home with them, reinforcing their progress beyond the hospital environment. Many of these videos find their way to the CopingClub.com website, for access by patients and families not currently in the hospital. Another core component of the Coping Cart is a clinical biofeedback unit used to teach patients relaxation, coping and anxiety management skills. The cart also contains a printer/scanner, medical toys, books, games, puppets, a library of patient-generated videos, relaxation instructions to be downloaded to CD or mp3 player, wireless internet access, and a video gaming system. Software used to teach patients and families coping skills is constantly being added, including materials from a treatment manual and workbook Dr. Carter is developing for children with chronic painful and fatiguing conditions called CHIRP (Children’s Health & Illness Recovery Program), which is being funded by the Norton Healthcare Community Trust. The Coping Cart was funded by a grant from the Kentucky Psychological Association Foundation through the Heads Up! Kentucky: Psychology Promotes Healthy Living project. As part of this nationally recognized innovative project, forty-one large fiberglass heads were painted and decorated by local artists and were displayed at various public and private locations in and around the Louisville area. The pedestals of these pieces of art contained information to educate the public about the importance of behavioral health in promoting an overall healthy lifestyle. These were eventually auctioned off, with proceeds from the auction funding the Norton Children’s Coping Cart project. Additional sponsors of Heads Up! Kentucky included the University of Louisville, the Humana Foundation, Anthem, UPS, the American Psychological Association, Beeline Courier Services, Seven Counties Services, The Kentucky Arts Council, members of the Kentucky Psychological Association and several other community organizations.